Are you as excited as I am about this hot new home improvement giveaway? Unless you’ve had your kitchen remodeled recently, you are probably just as desperate as I am to win this gift card. I’ll be honest, the last time my kitchen was updated, Walkmans were the popular way to take your music on the go and shoulder pads were in style for women. I took a peek at some of the cabinets that are offered from Cabinets To Go, and there are some gorgeous models to choose from. You can score real wood cabinets with solid birch frames and premium features such as soft-close drawers and hinges, stain-resistant wood veneer, and easy to clean, scratch resistant surfaces. No matter what style you are going for, I think you can find cabinets at Cabinets To Go that will satisfy you. Since you win a gift card, I’ll bet, but don’t hold me to it, that you could use the credit towards their flooring and counter top offerings too. What I wouldn’t do for a beautiful granite counter top. I currently have a laminated type countertop that is peeling apart and grungy at the seams. It feels like no matter how hard I scrub, it just never looks clean. The walls and backsplash are a real piece of work too. As much as I love to hear about Granny’s subscribers and fans winning the prizes, this is one prize I would adore to be the winner of myself. 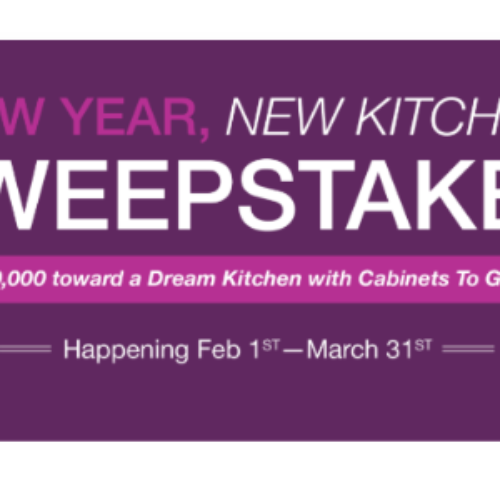 The best part if you win is, no only will you get the enjoyment out of your dream kitchen and it’s new cabinets, but it will also increase the value of your house. Now that is what they call a win – win! Tell Granny in the comments section below what year your kitchen was updated last! My cabinets were last updated in 1972. I would love to redo Mt kitchen cabinets. My house was built in 1915 and was part of an estate here in upstate NY. The kitchen cabinets are original and really need to be replaced. We have only owned the house for over a year and desperately want to update the kitchen. Hope I get this lucky win. My Kitchen Really Needs Re-done Badly.I Need All New Cabinets,They Are Very Old,Just don’t Have The Money To Do This.I Would So Appreciate Winning This and To Have More Storage For Cooking Items. I Cook Alot But The Way My Kitchen Is Makes It Hard To Deal With.Would Be Wonderful To Win! Just bought a house with original cabinets built in the 70s. The whole kitchen needs to be replaced! My house was built in 1998, thats the last time it was done. It needs it updating badly. My house was built in the 50’s and still has the same ugly cabinets. They are horrendous. I have hated them forever. I was promised before I moved here. That they would be updated and that was 10 years ago. I would feel so blessed to have cabinets installed. I keep looking on resell sites but they always beat me to it. Our cabinets are from 1980. I painted them so they are not too bad. Just old..very old and I like old things but.. small. Trust me I am grateful to have a kitchen at all because it’s something to be grateful for for sure. I’ll be honest, I can repaint my cabinets, but I have got to get rid of the moss green Corian countertops. Hideous things. We bought this house almost two years ago and I so wish we had upgraded some things before moving in. Hi there had some cabinets done in 2004 we did it ourselves, boy do we need a redo. Please help me get the kitchen of my dreams. Thank you I would love to win that gift card. The cabinets in my kitchen are original, and a rather horrendous dark brown. The house was built around 1979, and my mom and I bought it together in October 2018, she is 80 and wanted a home where she can remain for the rest of her life. She is too short for part of the upper cabinets and the lower ones are too dark for her to see inside. We hoped to remodel but the estimate is over 30 thousand! New cabinets would be a great joy for Mom, who still has many pots and pans. I have 37 cabinets and they are from 1957. We just painted them white and put new hardware on them. Just purchased our home, cabinets in the kitchen need a major overhaul.kitchen hasn’t been updated since the late 70’s when it was built. A remodel would be a wonderful surprise for my wife. Just purchased a condo all the cabinets need to be redone. Wanted to DIY but this would take us far! Would be a lovely surprise for my wife! I recently had a fire at my in home Daycare. My insurance company has been denying me money for upgrades the city requires. Leaving me to come up with the money for upgrades that I don’t have. It’s been delaying the work. It’s been a year and a month and I’m not back in my home. This would be a blessing for me and my Day care home. We’re building a modest retirement home. Cabinets To Go would make a lovely kitchen! We have never had a new kitchen with 26 years of military moves. But now we have moved into our forever home. We have lived here 2 years. Cabinets are cracked and peeling, laminate counters are hard to clean and floor is warped. We would be grateful with any improvement with out busy family with 10 kids still at home. Original cabinets and countertops from 1950s.